Experience the best of oriental beauty and contemporary chic in this glorious vacation home by the sea. 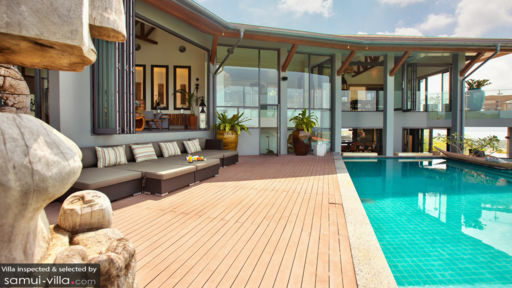 Located in Choeng Mon, Villa Skyfall is situated within close proximity to some of Samui’s most beautiful beaches, as well as a fine selection of restaurants, nightlife spots and shops. A total of eight bedrooms makes this dreamy vacation home ideal for accommodating large parties. Among these rooms, six are double rooms, while the remaining two consists of a master bedroom and a twin bedroom. Similar to the other living spaces, each of these rooms contains a seamless blend of modern and traditional fixtures. A private balcony extends out of the master bedroom and two of the doubles, offering a cosy spot for couples to snuggle up while enjoying the scenic surroundings of the villa. Additional facilities, such as a lift access to all the bedroom, puts this luxury vacation rental at a notch above the rest. 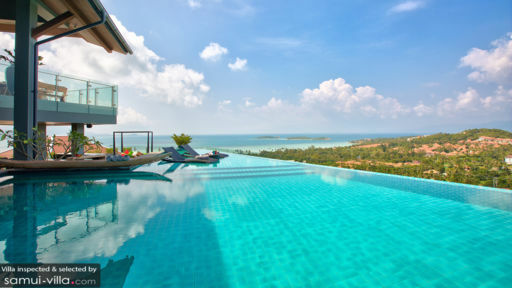 A glistening infinity pool and spacious wooden pool deck overlook the stunning coastline of Choeng Mon, as well as Koh Phangan and Angthong Marine National Park. The beautiful pool is perfect for the young and old alike, for it contains a deep section ideal for swimming laps, and a shallow area perfect for the little ones to splash about in. Step past the glass folding doors, and you will find yourself in the midst of a tastefully decorated living area. The interiors boast sleek contemporary touches, such as polished floors and furnishings with clean lines. A fine selection of oriental ornaments, ranging from Buddha statues to colourful paintings, lends an Asian accent to the modern interiors. 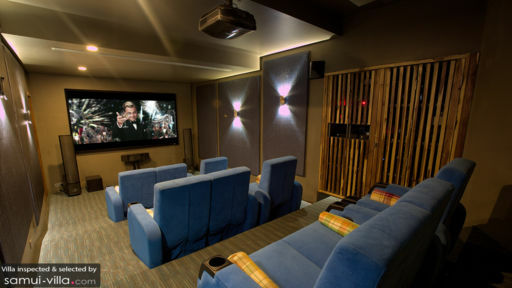 A variety of shared living spaces within the estate provide vacation makers with plenty of options for entertainment and relaxation. Work up a sweat in the tennis court, sip sundowners by the sleek indoor bar, play a round of billiards at the pool table, or catch up on the latest sporting events showing on one of the two large screen TVs in the bar. Take your pick between enjoying a feast in the gorgeous indoor dining area, flanked with expansive floor-to-ceiling windows, or dining alfresco in the cosy terrace. A well-equipped kitchen offers all the equipment that an avid cook will require. If you are not in the mood for culinary pursuits, let the personal chef or caterer whip up a storm of delicacies for your meals. Villa Skyfall is a full service property with three on-site staff. Housekeeping services, security services, welcome drinks, airport transfers and a daily breakfast service are included with your stay. Amenities available at additional cost include boat rental, vehicle rental and personal chef services. The villa provides child-friendly amenities. A baby cot is available for use free of charge, while professional childminders may be engaged at additional cost. Alluring Choeng Mon offers holidaymakers with plenty to see and do. Choeng Mon beach is located within walking distance, while a quick fifteen minutes’ drive will bring travellers to Chaweng beach, Bophut Fisherman’s village, and a widespread selection of shops, restaurants and nightlife spots. Villa Skyfall is beautiful, well maintained, spacious, has great facilities and enjoys a prime location to enjoy Koh Samui. Staff was accessible, helpful and prompt. Pool deck and set up was perfect to open the day, enjoy the day or close out an evening. We enjoyed great meals courtesy of the staff. All five in my party vowed to return.